I was flummoxed when I had to select a category for this post. It could have fitted into a few, but I guess Teaching and Pedagogy describes it best. I was lucky to be part of a select subset of the India Youth Orchestra, chosen to play in the Young Euro Classic Orchestra Germany-India last month in Delhi, India. The German contingent came from the Folkwang University Essen. The String Faculty for the enterprise was one remarkable man, flown in especially to help us train for two concerts in the city: Andreas Reiner. Viennese born violinist Andreas Reiner grew up in Eisenstadt, Joseph Haydn´s hometown and was a student of Werner Ehrenhofer, Edith Steinbauer and Itzhak Perlman. Having been noted as an unusual talent very early he played his first solo concerto at the age of seven. He appeared on stage in most western and eastern European countries, in North and South America and Japan. Enjoying the support of some of the finest names in music he was on many occasions Heinrich Schiff’s violinist in the Brahms Double Concerto and played recitals and chamber music with Murray Perrahia, Christian Zacharias, Roger Vignoles, Aci Bertoncelj, Tsimon Barto and Jean-Yves Thibaudet. In 1991, after a short interlude as leader with Celibidache’s Munich Philharmonic Andreas Reiner founded the Rosamunde Quartet, which he lead until 2009. The Rosamundes appeared in concert around the globe, recorded for ECM an were awarded numerous prices and honours, including the Diapasson D’Or, the »Preis der deutschen Schallplattenkritik« and a nomination for the Grammy. Andreas Reiner teaches chamber music at the Folkwang University in Essen, Germany and plays on the famous »King Max-Joseph« Stradivarius. I’d like to share what I learnt, in the very short time that he mentored us. As I transcribe the notes I made and review the videos I took during the two days he spent teaching us, I am struck by the number of references he made to beauty. And that is the one thing I found most useful. It seems so obvious, but is so often overlooked. Every note you play, should be beautiful. Try to play every note with your whole person. The beauty comes from caring. You have to want to produce a beautiful note. This beauty also comes from a feeling of being relaxed. Search for the notes. As soon as you get it, play it with beauty. Find a way that works for you, to create beauty. Be aware of each note. Each note starts and ends. Pay attention to all of it. It is like speech. Each note should “speak”. Deal with each note as you would with a person. Say “hello”, “goodbye”. “Hear” the note before you play it; how each note sounds. If you play old Heifetz recordings in slow motion, you will observe that each note, no matter how tiny, is well-rounded and shaped. Play each note with conviction — to create beauty. Play each note like it is your last note. Never play “ordinary” notes, even if just warming up, or tuning up. No careless notes. That’s negative practice. We musicians bring beauty to the world. Be truthful to yourself. Don’t betray yourself. Our biggest danger is when we start to lie to ourselves. 3. The right hand is like the suspension of a car. It should be “loose”, yet firm i.e. supple. The thumb and the middle finger of the bow hand are positioned opposite each other, and form the point of pivot for above-mentioned “suspension”. There is a quite a bit of strength involved here. The rest of the fingers just rest, or lie, on the bow. The “pinky” must be round. It plays a very important role. It starts to move the bow a little (“car suspension”) with the other fingers. The index finger is used for power, for accents. Each move involves a nerve impulse, expenditure of energy. The less your left hand moves in passage playing, the better. It should be “cool”, “cold”, scientific. Involuntary finger movements are a major cause of a bad sound. Don’t move fingers that are not involved. Expect yourself to have a still, calm, left hand. Don’t be too “loose” on the fingerboard. Have decisive finger action. The bow determines the speed, the character of the music; imparts the feeling of breath. Don’t play your bow like a drunk butterfly. Set the bow down the moment it begins to travel, not before. Start just a little off the string. Touch the string at the same moment you start moving (i.e. the bow starts to “travel”). Go down onto the string with the same speed as you intend playing the note. It is an individual taste. Like pepper and salt. Great singers should be an example on how to create vibrato. The beauty of a vibrato comes from it being the “right” speed, or “size”. Good tone from vibrato needs a centre. Don’t “prepare” a vibrato. First have the note, then vibrate. Vibrate only when you have a clear, stable note. Vibrato has a lot to do with intonation. Vibrate where you want to, not where you can. Practise vibrato best with scales. The vibrato should be nice and round; not too fast. Vibrato needs muscle power. Develop the muscles. A powerful vibrato demands a fully contracted biceps. 7. Shifting: Don’t shift with your fingers, but with your hand. The whole hand (the whole “mechanism”) should move. The whole hand should shift as slowly as is necessary (Heifetz). Small break in bow stroke during shift. Inaudible. 8. 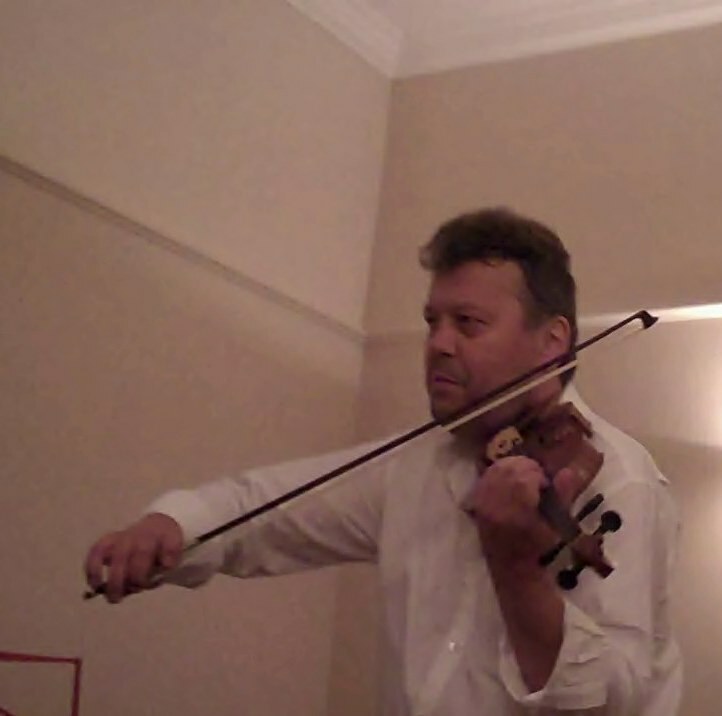 The position of the violin without a shoulder rest is more flat, and the sound is better. 9. There are three important intervals in music: the octave, the perfect fourth and the perfect fifth. The interval of a third (in a triad) is a matter of “taste”. But the intervals of the octave, the perfect fourth and the perfect fifth are NOT. 10. Tuning up: always tune from below. In case the bow hair has too much rosin and residue on it: Take the frog off the bow-stick. Using an old toothbrush, apply 70% alcohol to the bow hair, allow it to dry. Then apply rosin powder onto it. The bow hair gets a new lease of life. I enjoyed reading the comments. My own teacher makes me keep away from tiny bowings, which I was in the habit of doing while warming up. She didn't say so, but she was probably trying to get me in the habit of always making a beautiful sound. I especially liked what Mr. Reiner said about vibrato. At least he qualified his statement saying to emulate great singers. Thank you, Francesca! The lessons with Reiner were so illuminating, that I just had to share what I learnt, with others!